To date I have theorized about the behavior of certain types of spinlocks, now I have access to hardware which can put these under serious pressure I can quantify much of what I have blogged about. This serializes access to the part of the database engine that serves out transaction ids. What Do You Class As A “Big Box” ? I class a big box as one with enough physical cores to generate pressure on unique points of serialization within the database engine. There is one particular unique point of serialization I’m thinking about; the LOGCACHE_ACCESS spinlock. Earlier tests suggest that a server with two CPU sockets with more than six cores per socket is required to stress this spin-lock. Baseline configuration trace flags: 1117, 1117, 2032 and 8008. Storage: RAID 0 64K allocation size volume composed of 3 x SanDisk Extreme Pro solid state drives (480GB) and 1 x FusionIO (Gen 1) 320GB ioDrive. 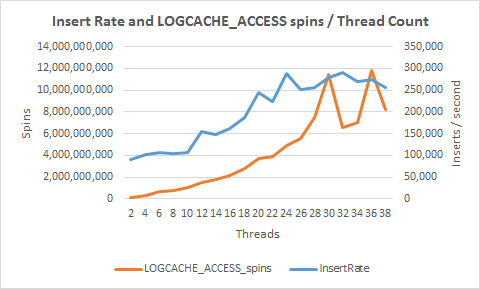 Can We Do Anything To Reduce LOGCACHE_ACCESS Pressure ? 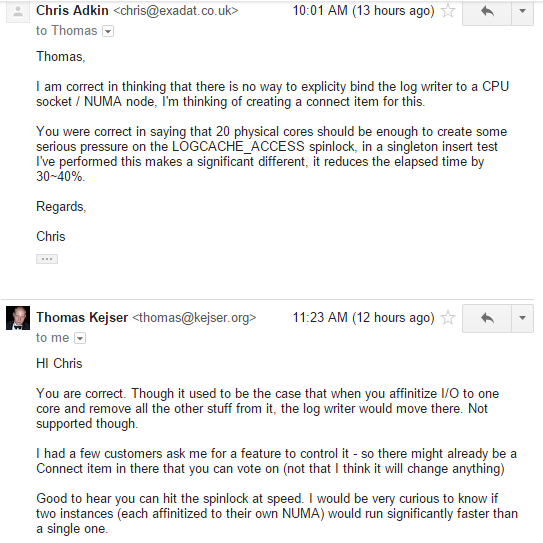 The implication is that the excessive spin activity on the LOGCACHE_ACCESS spinlock is throttling log writer flush IO throughput when the default CPU affinity mask is in use. Where Is Our CPU Time Going ? I’ve highlighted LogAppendContext::BackOff, with the default CPU affinity mask this accounts for 23.89% of the total sampled CPU time, after removing core 0 from the CPU affinity mask this plummets to 1.43% !!!! 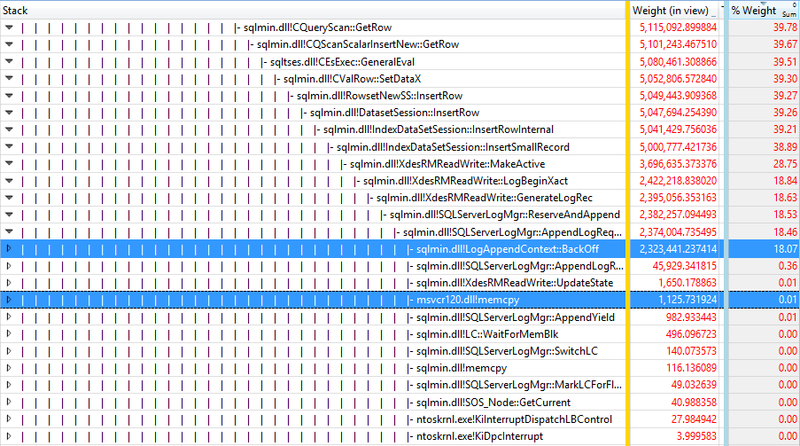 We can see the memcpy function used to copy a sessions logging information into the log buffer and a call to sqlmin.dll!SQLServerLogMgr above it preceding our call to sqlmin.dll!LogAppendContext::BackOff. This suggests we are in the right area for log buffer access serialization. 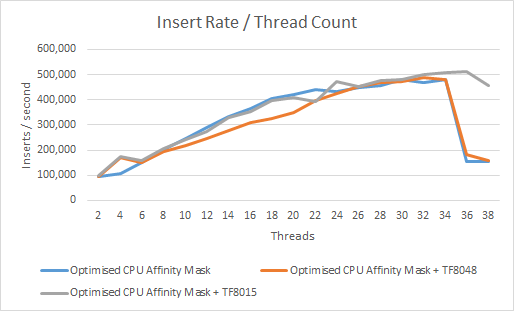 Having established that removal the core the log writer is running on from the CPU affinity mask has a major impact on the insert rate, what do the various spin-lock and insert rate metrics look like ?. 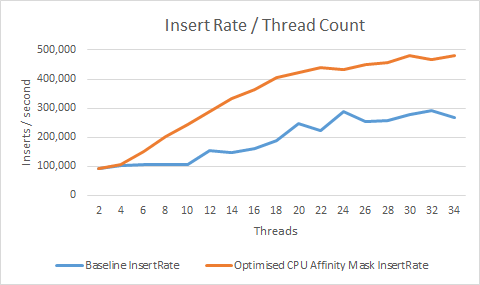 In the graphs below ‘Baseline’ refers to the tests with the CPU affinity mask in its default state and “Optimized CPU affinity masks” refers to the CPU affinity mask without the log writer CPU core present. 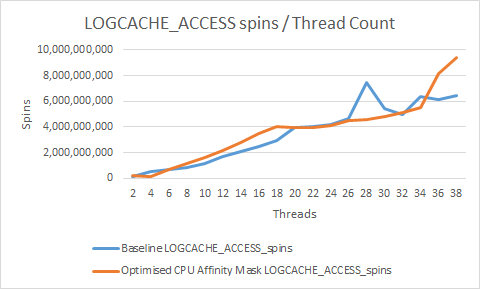 Referring to the LOGCACHE_ACCESS spin comparison graph, if we take away the outliers, the spin activity for this spin-lock is relatively static across both tests, the key thing to note is that we are achieving a superior insert rate with the modified CPU affinity mask despite the LOGCACHE_ACCESS spin rate remaining almost the same. Improving the efficiency with which the LOGCACHE_ACCESS spin-lock is acquired and released increases pressure on the XDESMGR spin-lock. How Has This Worked Exactly ? 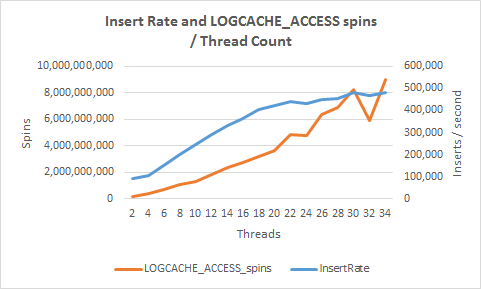 The speed at which the LOGCACHE_ACCESS spinlock can be acquired and released is determined by how fast it’s cache entry can be handed off to the CPU core running the task thread attempting to copy logging information into the log buffer and returned. 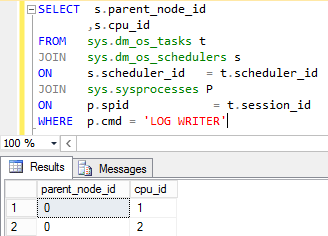 Allowing other database engine threads to run on the same core as the log writer introduces the possibility of the log writer thread being context switched in before this “Hand off” can take place. 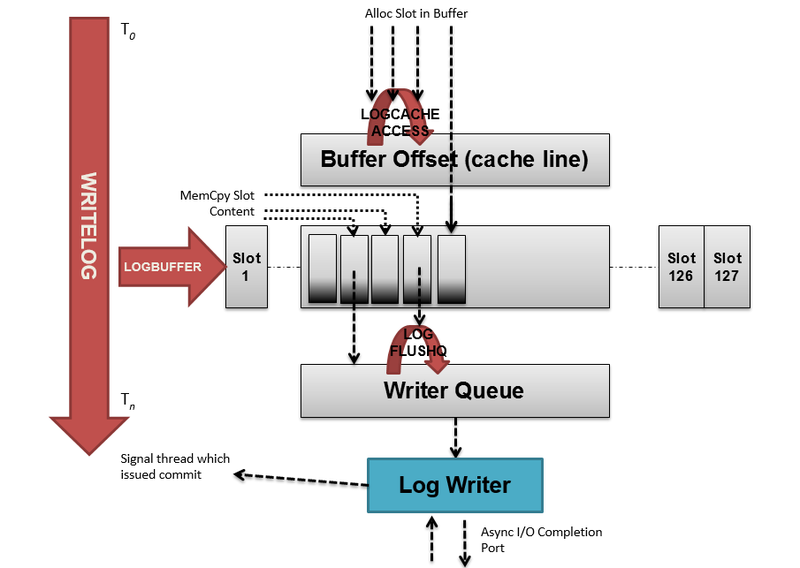 ‘Affinitizing’ the rest of the database engine away from the log writers home CPU core expedites the hand off process by minimizing the number of context switches that might get added to this hand off process. The overhead of storing / restoring registers (not counting any TLB overhead / excluding cost of FPU register store / restore) is 188 cycles on the P4 (67 ns), 79 cycles on the P2 (395 ns). A context switch also includes the overhead of switching address spaces (if we’re switching between processes, not threads). The minimal cost of switching between two address spaces (counting a minimal TLB reload of 1 code page, 1 data page, and 1 stack page) is 516 cycles on a P4 (184 ns) and 177 cycles on a P3 (885 ns). Excluding the cost of a process or thread transitioning from user mode to kernel mode, a context switch costs upwards of twice the number of CPU cycles required by main memory access. 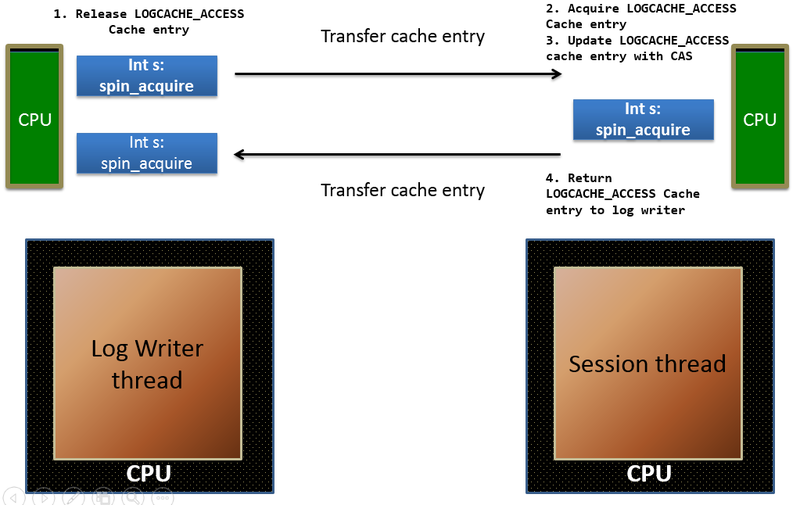 b) By the scheduler thread switching between the task and the log writer, when the log writer gets the CPU core again it is likely it has lost data and instructions it needs in the L1/2 cache due to cache pollution. Which NUMA Node Does The Log Writer Run On ? All logical processors are selected for NUMA node 0 except for the first and last two. Can We Influence Which NUMA Node The Log Writer Is Assigned To ? Why ‘Affinitize’ Two Instances To Their Own NUMA Nodes ? The worse case scenario for the transfer of spinlock cache entry is the latency of the level 3 cache and not the quick path interconnect between CPU sockets. One instance per socket for a two CPU socket server doubles the number of LOGCACHE_ACCESS and XDESMGR spinlocks available. If each instances memory can be allocated 100% from the bank of memory associated with each CPU socket, this reduces foreign NUMA node memory access which is more expensive than local node memory access. the post states that the trace flag is to be used when waits and latching activity on CMEMTHREAD and SOS_SUSPEND_QUEUE are present, despite this not being the case with any of the tests performed, I would still like to see what the effect of using this trace flag is. 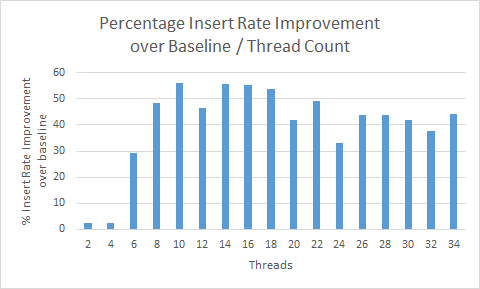 Much to my surprise trace flag 8015 results in the best throughput over 500,000 inserts / second with 36 threads. 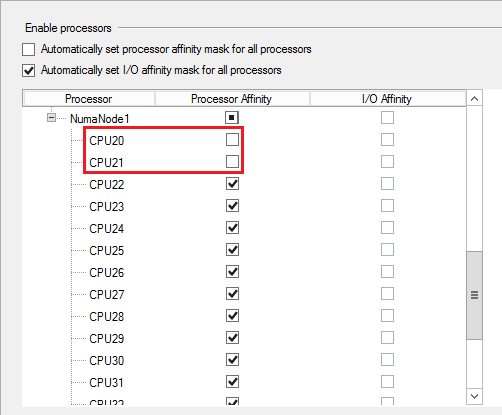 – Remove the CPU core the log writer is running on from the CPU affinity mask. – ‘Affinitize’ the insert threads to the same CPU socket that the log writer is running on, more on this later. Since the tail of the transaction log is typically a bottleneck, reducing the number of log records appended to the log can improve scalability and significantly increase efficiency. Furthermore the content of the log for each transaction requires less space than systems that generate one log record per operation. Generating a log record only at transaction commit time is possible because Hekaton does not use write-ahead logging (WAL) to force log changes to durable storage before dirty data. Dirty data is never written to durable storage. Furthermore, Hekaton tries to group multiple log records into one large I/O; this is the basis for group commit and also a significant source of efficiency for Hekaton commit processing. This serializes access to the part of the database engine which serves out transaction ids, the only option for reducing pressure on this spin lock to increase the number of DML statements and / or effected rows per transaction. 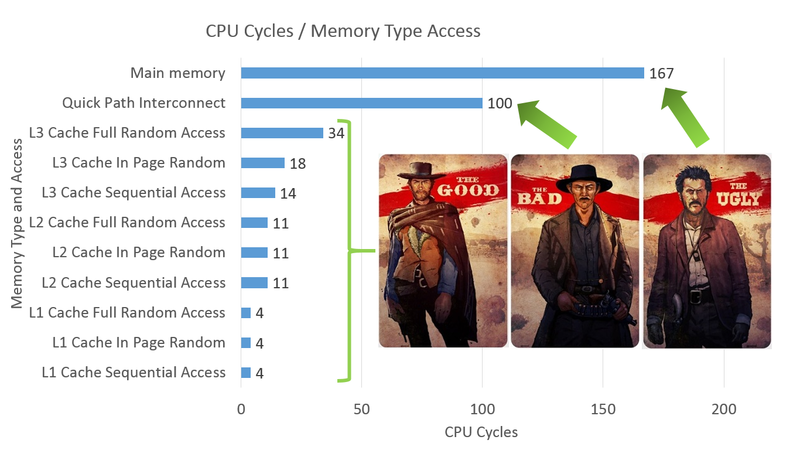 How Can The In Memory OLTP Engine Help ? 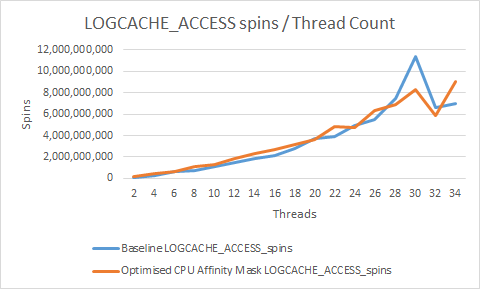 The in memory OLTP engine is latch and lock free, but not spinlock free, 14.46% of the total sampled CPU time is expended on one spin-lick, but which one ? From its association with the GetXdesId function, this spin-lock is the XDESMGR spin-lock. 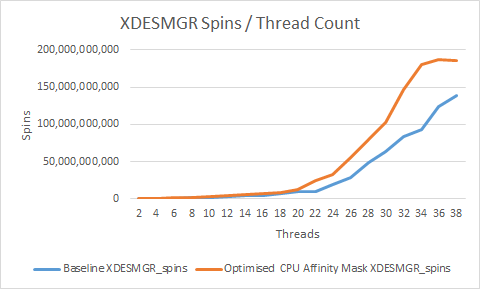 Would lowering the overhead of SQL language processing result in more pressure being placed on the XDESMGR spin-lock such that the net performance gain from using in memory OLTP engine is negligible ?. Reducing pressure on the XDESMGR spin-lock. How the distance spin-lock cache entries have to travel between CPU cores and sockets effects performance. Spin-lock pressure points when using the in memory OLTP engine compared to the conventional database engine. Wow, you have surpassed yourself here. As I mentioned to you yesterday, these blog posts are very stack-intensive – I find myself constantly having to save context and learn some more background in order to keep up! One thing which I didn’t use to want to believe is now clearer. While Microsoft keeps exposing more and more “magic levers” in the form of trace flags and config options, there is still a lot wizardry (and I suppose occasional gambling) involved in finding the sweet spot among the permutations. Kind of wondering as well if the ongoing task of pushing the limits will be driving more aggressive code optimisation within SQL Server. Premature optimisation and all that: 99% of code probably doesn’t run in a tight enough loop to warrant CPU cycle and instruction counting. But the harder you push throughput on single-CPU activity, the lower that 99% will become. And at some point somebody may even ask if some bits deserve to be written in no-holds-barred assembler. SQL Server now lives in an Intel monoculture world which has changed a lot from the NT days where cross-platform portability was The Thing. Certain code paths within the database engine are pretty optimal. Rather than code in assembler, and note that a good optimizing compiler should embody all the tricks of an expert assembly language programmer anyway, a database engine developer should focus on leveraging the CPU. This means using data structures which can be laid out and walked in memory sequentially where possibly in order to help the pre-fetcher, leveraging SIMD, knowing you way around the CPU KPIs and low level profiles such as VTune, knowing that when two threads write to the same cache line (entry) in the CPU cache that this bounces the level 2 cache etc etc. The bigger problem is that there are core things that a relational database engine does which are not CPU friendly, hashing, sorts and the index seeks associated with the nested loop join all destroy CPU cache efficiency. Regarding instruction set compatibility due to a cross licensing agreement between AMD and Intel whereby Intel license x64 from AMD and AMD license the x86 instruction set of Intel, this should be a non issue. To answer the question regarding magic levers must best advise is that this requires leg work on the grounds that no two workloads are identical, also the SQL community in general likes to dive into espousing performance tuning techniques without presenting much in the way of test evidence, i.e. this is my test hardware, this is how I configured SQL Server, this is how I generated my test data, this is how I ran my test to obtain a baseline, I hypothesize X, lets change Y and re-run the test in order to see if my theory holds true. A lot of material talks about straight OLTP or OLAP, I don’t thing this clear segregation exists in the real world as I suspect there is a hell of a lot of operational BI out there. As to what you can do, there is quite a bit which will be subject of the second new deck I will create for presentation on “The circuit”. Thanks for that very considered response, Chris. I agree wholeheartedly with you about testing and knowing your experimental conditions, although I must admit that most of us tend to be content with generic “best practices” – hopefully acceptable habits that see you through the day except when you live near the edge. Just to clarify my comment about different CPUs, I wasn’t referring to AMD vs Intel but to the historic situation where there were other serious contenders (SPARC, Alpha, Itanium…). My point being that the 90s, where NT and SQL Server are rooted, involved more reticence about betting the farm on a specific architecture/instruction set and there was a good business case for abstracting details away as much as reasonably possible. Nowadays we still have the situation, but really only with mobile devices that won’t be running enterprise DBMSs, so in that sense we’re closer to a CPU monoculture again. I agree that a good optimising compiler should do wonders, and while I don’t have the expertise or time to assess this properly for myself, my perception is that real-world compilers tend to lag behind the cutting edge of what is possible, e.g. not favouring branchless logic or the use of SIMD. Now I’m not saying there is any NEED for this, but in the process of removing other bottlenecks it might come to light again one day. Unlikely I suppose except for tight code loops which can do a lot of useful work without memory fetches. It should have been SET @i += 1, thanks for pointing this out.